Your transportation service is growing -- and so are the demands on your budget. Non-Emergency Transportation (NET) Ridership continues to grow exponentially -- along with demands for greater efficiency. It’s nearly impossible to succeed financially without more effective route and driver tracking -- the kind of monitoring only available with effective, user-friendly digital technology. TransiTrak fits that description perfectly. In fact, it’s the optimal route organizational tool for NET providers -- because it was developed specifically for NET providers. With its simple, user-friendly grid format, NET managers can organize and manage routes more efficiently and in a fraction of the time. But don’t let its simplicity fool you: TransiTrak also has the capacity and features demanded by a large transportation service with hundreds of daily riders. 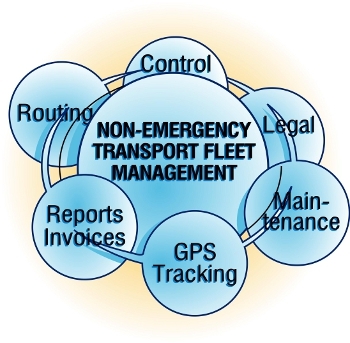 • Auto-track information critical for managing inventory, maintenance, employees and billing, create LogistiCare Compliant Invoices. And there’s no need for expensive computer equipment or in-house servers. You can operate TransiTrak with a desktop computer and a broadband internet connection to access your data on TransiTrak’s reliable and secure remote servers. Contact us today to learn more about our competitive packages and pricing -- we have a plan that meets your size, operation and budget. TransiTrak -- your answer to better fleet management. Integrated - enter data one time and TransiTrak will automatically integrate it throughout your database. User Friendly - organizes routes and trips into an easy to use grid format. Easily add, change or delete trips with a few simple mouse clicks. Intuitive - capture information easily from a range of suppliers, internal systems and employees without direct fleet management intervention. Versatile - our team can customize TransiTrak to meet your size and critical tracking and reporting needs.